Comfort. Protection. Mobility. Rigid side supports and thick foam, linked to a rigid stirrup help prevent side-to-side movement, while hinges allow foot to flex forward and backward. The T2 performs like the Trainer Model. Features single, quick-fastening strap. Ideal for athletes seeking protection, performance and maximum comfort. 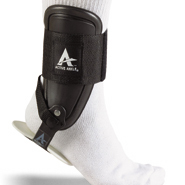 AS1 Ankle Brace TOP SELLER!!!!! Used by national soccer teams worldwide. Lightweight and flexible Ansotex fabric is reinforced with supportive steel springs to protect against inversion sprains. High front cut and narrow bottom allow more foot movement. Full back elastic for Achilles tendon comfort for racquet sports, running, wrestling, gymnastics and cheerleading.